Adrenal gland, Cortex - Pigment in a male F344/N rat from a chronic study. There are scattered individual cells in the inner cortex (arrow) containing yellow-brown pigment. M = medulla. 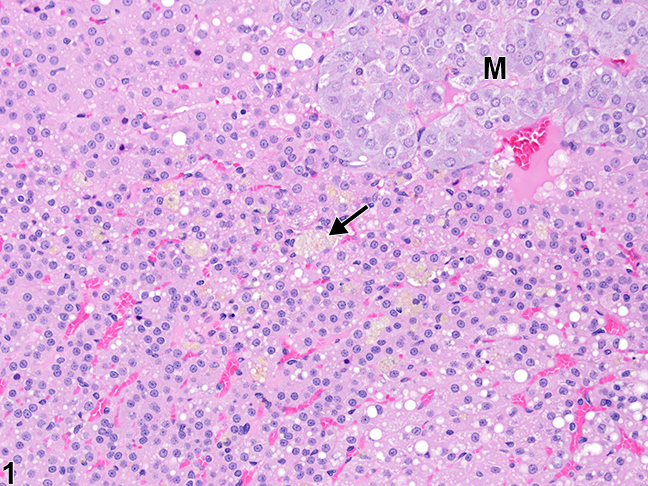 Adrenal gland, Cortex - Pigment in a male F344/N rat from a chronic study (higher magnification of Figure 1). Discrete, foamy cells in the inner cortex (arrow) contain yellow-brown pigment. Pigments in the adrenal gland are most commonly found in the cortex but can also be seen in the medulla and adrenal capsule. 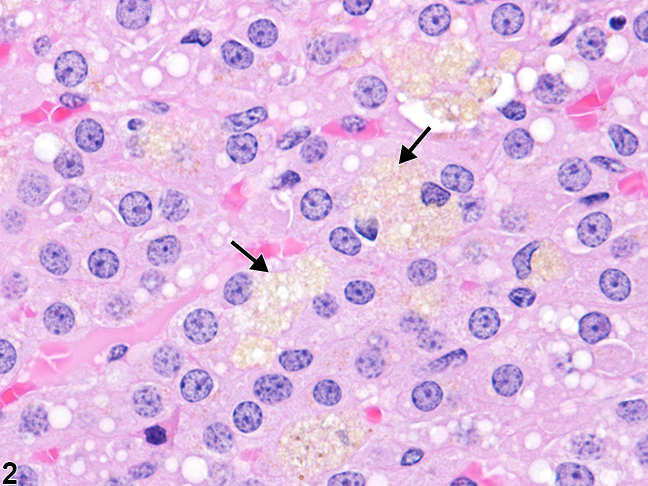 Adrenal cortical pigment in mice and rats is usually lipofuscin deposition, which is characterized by the intracytoplasmic, yellow to dark brown, granular to amorphous material that fills and distends adrenal cortical cells. The cytoplasm of the swollen cells may appear variably vacuolated or "foamy" ( Figure 1 and Figure 2 ). Lipofuscin deposits may be autofluorescent and are usually sudanophilic and positive with periodic acid-Schiff (PAS) and acid-fast stains; positivity with iron stains is variable. Hemosiderin pigment may also be present as a sequela to hemorrhage. 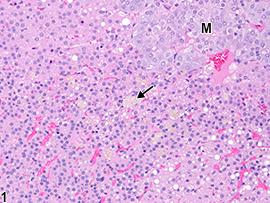 Hemosiderin pigment is typically found in macrophages and is golden brown to dark brown. Lipofuscin refers to heterogeneous mixtures of intracytoplasmic, usually intralysosomal, nondegradable residues of lipid and protein oxidation/polymerization (as well as other moieties, such as advanced glycosylated end products) that accumulate in various somatic cells due to aging or other factors. Excessive and/or temporally inappropriate adrenal lipofuscin pigment aggregations (compared with age-matched controls) can also be a feature of cortical cell degeneration and/or atrophy (due to various causes) or can result from dietary imbalances (e.g., vitamin E deficiency) or administration of certain exogenous chemicals. 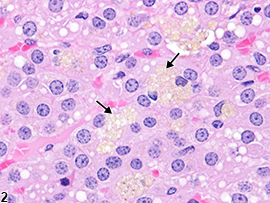 In mice, lipofuscin pigment-laden adrenal cortical cells occur most often as late-stage features or sequelae to physiologic regression of the X-zone. Thus, they are common incidental findings in aging mice. The pigment-laden cell aggregates are located primarily in the region adjacent to the corticomedullary junction formerly occupied by the X-zone. Milder, less temporally advanced cases consist of scattered small foci of pigment-laden cells, but as the animal ages the cell clusters often enlarge and can coalesce into circumferential bands surrounding the medulla. Macrophages containing similar lipofuscin and/or hemosiderin can be interspersed among the affected cortical cells. In rats, cells in the adrenal cortex containing lipofuscin pigment are also a common age-related incidental change. Even though rats do not have an X-zone, the pigment-laden cells tend to be most common in the inner cortex, usually as single cells or very small clusters ( Figure 1 and Figure 2 ), unlike the large, prominent aggregates often seen in mice. Pigment deposits that appear to be primary treatment-related changes should be diagnosed and assigned a severity grade and site modifier (i.e., cortex, medulla, or capsule). If it is present in both the cortex and medulla, the site modifier may be omitted and the location described in the pathology narrative. Definitive identification of pigments in various tissues is often difficult in histologic sections, even with a battery of special stains. Therefore, the recommended diagnosis is "pigment" without a type modifier (as opposed to diagnosing the type of pigment, e.g., "pigment, hemosiderin" or "pigment, lipofuscin"). The morphologic features of the pigment should be described in the pathology narrative. Not all pigment deposits have to be diagnosed, however, as some are almost ubiquitous spontaneous changes in aging animals and/or secondary to extraneous disease processes. Pigment associated with X-zone regression in mice should not be diagnosed separately. The cortical cell pigment that accumulates as a spontaneous aging change in rats and mice should not be diagnosed unless there are treatment-related differences in incidence or severity. The pathologist should use his or her judgment as to whether such secondary pigment deposits are prominent enough to warrant a separate diagnosis. Hadjiconstantinou M, Tijoe S, Alho H, Miller C, Neff NH. 1987. 1-Methyl-4-phenyl-1,2,3,6-tetrahydro-pyridine (MPTP) accelerates the accumulation of lipofuscin in mouse adrenal gland. Neurosci Lett 83:1-6. Moore NA, Callas G. 1975. Observations on the fine structure of propylthiouracil-induced "brown degeneration" in the zona reticularis of mouse adrenal cortex. Anat Rec 183:293-302. National Toxicology Program. 2013. NTP TR-578. Toxicology and Carcinogenesis Studies of Gingko biloba Extract in F344/N Rats and B6C3F1 Mice (Gavage Studies). NTP, Research Triangle Park, NC. Parker GA, Valerio MG. 1983. Lipogenic pigmentation: Adrenal cortex, rat. In: Monographs on the Pathology of Laboratory Animals: Endocrine System (Jones TC, Mohr U, Hunt RD, eds). Springer, Berlin, 64-66. Reichel W. 1968. Lipofuscin pigment accumulation and distribution in five rat organs as a function of age. J Gerontol 23:71-78. Samorajski T, Ordy JM. 1967. The histochemistry and ultrastructure of lipid pigment in the adrenal glands of aging mice. J Gerontol 22:253-267. Shimokawa I, Higami Y, Horiuchi S, Iwasaki M, Ikeda T. 1988. Advanced glycosylation end products in adrenal lipofuscin. J Gerontol 53A:B49-B51. Terman A, Bruk UT. 2004. Lipofuscin. Intl J Biochem Cell Biol 36:1400-1404. Torrey CE, Wall HG, Campbell JA, Kwanyuen P, Hoivik DJ, Miller RT, Allen JS, Jayo MJ, Selinger K, Savina PM, Santostefano MJ. 2005. Evaluation of the carcinogenic potential of clofibrate in the FVB/Tg.AC mouse after oral administration: Part I. Int J Toxicol 24:313-325. Ward JM, Reznik-Schüller H. 1980. Morphological and histochemical characteristics of pigments in aging F344 rats. Vet Pathol 17:678-685. Weglicki WB, Reichel W, Nair P. 1968. Accumulation of lipofuscin-like pigment in the rat adrenal gland as a function of vitamin E deficiency. J Gerontol 23:469-475.